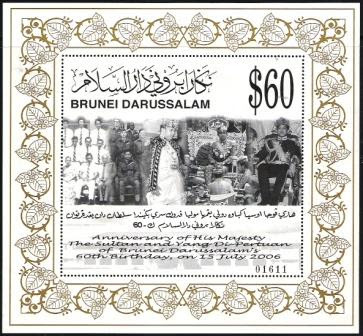 In 1996 when His Majesty celebrated his 50th birthday, our Postal Services issued Brunei's highest face value stamps ever. Five stamps in a miniature sheet each with a face value of $50 per stamp was issued. The miniature sheet was sold at $250 in a framed cover. This remained the most expensive face value item that the Postal Services had issued in its entire history (though in 2006, the postal services issued a $60 stamp to commemorate His Majesty's 60th birthday). That miniature sheet now has a catalogue value of some $1,000 and almost impossible to find. I managed to find one - the last one in this particular philatelic agency I went to - and luckily not at the full catalogue value. According to the agency that sold it to me, it bought 10 in 1996 and only managed to sell all 10 in the period of about 12 years. This sheet must not be that popular because of the expensive cost. Anyway, I have the feeling that not many have seen it and since it is quite attractive and not to mention an unusual piece of Brunei's history both philatelically and otherwise, I thought I will post it up here so that everyone can look at it. I was away in Singapore for the last week. I managed to visit a number of philatelist and numismatist agencies in Singapore and managed to find a few gems. When I arrived back, there were also a number of items that arrived from ebay. One of them is the Straits Dollar $1 note of 1911. This is part of the 1906 to 1924 series which the Straits Settlement Government in Singapore issued. I have one which is of 1916 variety which I have posted here in the past. This is probably one of the more difficult note for me to obtain. 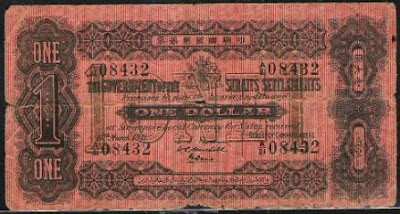 This note and the 10 cents and 25 cents paper notes issued just at the start of the Second World War were the only surviving set of paper notes issued by the Straits Settlement Government. The printers sent a whole set of currency but the story was that the German intercepted the ship that carried the other currencies and only these three notes were able to reach Malaya and Singapore. 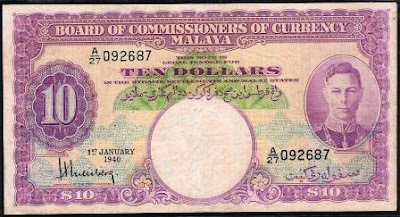 For Brunei, this note is the first ever paper currency note to carry the Brunei crest (see lower quarter right). The subsequent notes have been with the national crest. I haven't been updating the numismatic side of this blog. Actually I have bought a few currency notes but I have been a tad too busy to scan them to put up on the blog. One of the last few which arrived is my purchases of old Saudi riyals. I managed to get this particular 1968 50 riyal note. It's 40 years old and about the same age as Brunei's first Sultan Omar Ali note of 1967. 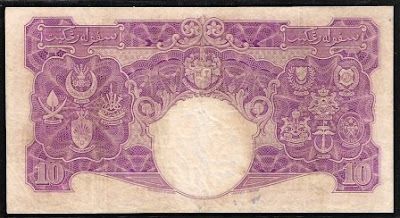 This riyal note series is the last before the portraits of the Kings of Saudi Arabia appears on it, the first of which is 1976. Early Saudi notes are interesting as they carry no King's portraits on them. I collect stamps, first day covers and normally get them from overseas, so I received a fair number of letters as well. Once in a while I wondered whether all my letters are on time as I know I have quite a few which have not arrived yet. This one took a few months to arrive and when it did. Look. It went on a tour round the world from Belgium to Bermuda and then to Malaysia. In 1952, Sultan Omar Ali Saifuddien who had taken over the throne on the death of his elder brother, issued the first definitive stamp with his portrait. 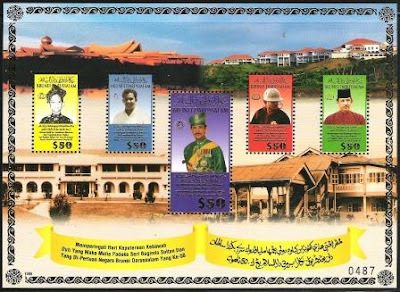 The previous Sultan, Sultan Ahmad Tajuddin did not issue any definitive stamp but did issue a special commemoration in 1949 to celebrate his 25th Silver Jubilee on the throne. 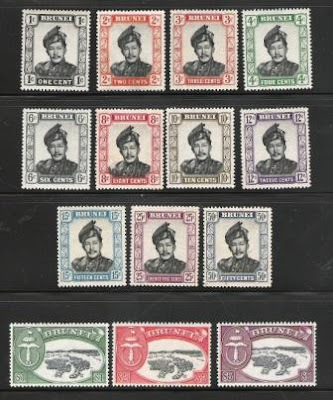 The Sultan Omar Ali series were issued from 1952 to 1971. Three definite series can be determined. The first series was issued in March 1952 on papers with watermark multiple script CA and a perforation of 13. The second series was issued from 1964 to 1968 with the only difference with the earlier one of the watermark changed to Block CA. The other difference is that the second series only issued stamps up to $1 value. Despite Sultan Omar Ali abdication of the throne in 1967, the third series of definitive stamp using his portrait continue with the third series issued from 1969 to 1971. This time the paper was changed to glazed paper but the watermark was unchanged still using Block CA and the perforation remaining 13. By the time you read this, this item will be in someone's hands. I have bid for it on ebay but the price has gone beyond my financial limit. It was US$227, way above the US$150 max I put on it. Why is this valuable? Firstly, this is a Brunei stamp overprinted during the Japanese occupation of the country. That makes a used stamp expensive. Think of how many Bruneians sending letters in those days. Secondly, this was postmarked Limbang. Limbang, as you know, is currently a part of Malaysia and had been a part of Sarawak ever since it was forcefully taken away from Brunei in 1890. 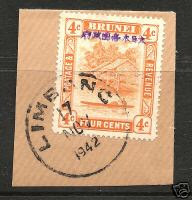 For a Brunei stamp to be postmarked in Limbang is almost impossible except during the Japanese occupation when they treated all the British Borneo territories as one prefecture. And that's why the 4 cent stamp could exceed US$300 by the time you read this. This is my latest pride and joy. I have often seen these in books and catalogs and I have only seen one real one at the Postal Gallery at Brunei's General Post Office in Bandar. When I saw it come up for auction at Spink's and with my recent promotion, I thought I will treat myself. It was listed at around GBP120 but I thought I will put up the bid to about GBP220 wanting to make sure I don't lose it. I won it at GBP180. This FDC is the first of Brunei's stamps. It had a controversial beginning. Declared as bogus by some as it was printed by a fellow called Robertson who obtained a concession from the Brunei Sultan. Robertson's ulterior motive was to cash in on stamp collections and examples of his letters leave us to no doubt. He did try to run the postal service system in Brunei but by 1902 or 1903, that ran down as well. 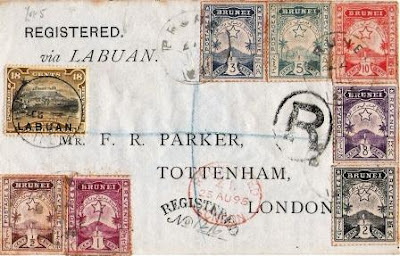 Since Brunei at that time did not belong to UPU, the FDC sent to London had to be overprinted with the Labuan stamp as well. That's why the FDC also bore one Labuan stamp. Not all the Brunei stamps are on this FDC, the last 3 high values, 25c, 50c and $1 are not affixed.